Just these two words alone bring about a quickening of the pulse, a twinge of excitement that will rise to giddiness by game time this afternoon. We’ve been waiting (and waiting) for this to arrive — through the disappointing months of last October and November as we still tried to figure out where it all went wrong for the 2010 season. Through the snows that piled up in December and January and the giant blizzard in February, we dreamed about today and sought comfort in the feelings it would bring. The Cardinals Winter Warm-Up was a brief glimpse of what was ahead in 2011, a quick look at our old favorites and new players. Spring training was a six-week appetizer, baseball again but not real enough to mean anything. Now we’re ready for the main course, 162 games from now through the end of September and hopefully beyond throughout October. And of all the days in the season ahead, today is the best one. Sure, it’s a blank slate for everyone — a glance at the standings displays uniform zeroes across the board (and Baltimore atop the AL East standings). But it’s the Cardinals Opening Day that’s truly one of a kind, a celebration of the team and its history that’s unique. 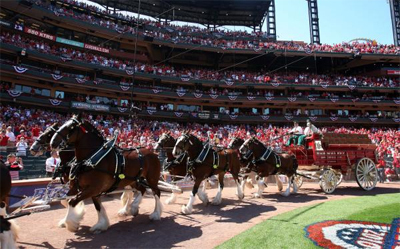 We’re familiar with the traditions and eagerly await them: the majestic Budweiser Clydesdales kicking off the parade around the track (and, according to a Cardinals press release, accompanying them will be 9-year-old Alex, thanks to the Make-A-Wish Foundation and Cardinals Care). 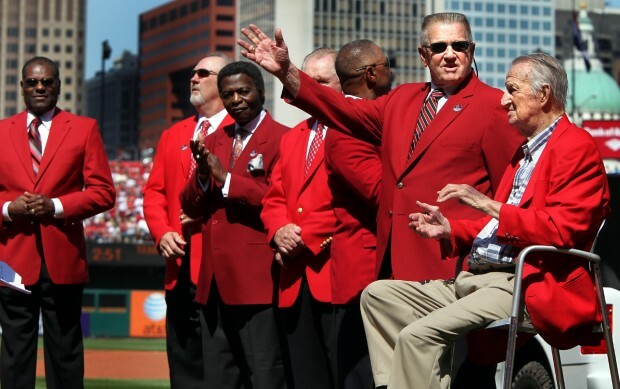 Next, one by one and riding around the track, are the Cardinals Hall of Famers (who, according to that same press release will now — thankfully — be wearing matching, custom-made red blazers. I do love the idea of them all in red, but, as you can see from the picture, they didn’t quite all have the same shade). Following them are Tony La Russa and the coaches. And then comes the team, starting with the reserve players and then the starters. As they exit their truck around home plate, each guy passes through a receiving line of the Hall of Famers, getting the opportunity to shake hands and exchange greetings with Bob Gibson and Lou Brock and the great Stan the Man and all the rest. Oh, and all the while, this is played over and over and over. Watching the festivities on television certainly gives a feel for the experience, and never fails to make me cry — especially seeing Stan the Man. (Thankfully, I discovered that both Emily and Miranda are the same way. In fact, I think we were ready to cry last night just talking about it on Twitter!) Hearing the roar of appreciation for the new Cards too is always such a thrill. Of course Lance Berkman will be warmly greeted today. And Jake Westbrook will experience his first Opening Day cheers as a Cardinal, and Daniel Descalso, Gerald Laird, Bryan Augenstein and pitcher/poet Miguel Batista too. Then there’s Ryan Theriot. I’m still working at learning to love him, and today will hopefully help me break through for good. Because it’s the day, as Miranda said, when the Cubs aura surrounding him that’s been freaking us out a bit will finally disappear when he reaches that receiving line. A touch from Lou Brock and Bruce Sutter in particular — ones who’ve been in his shoes in moving to the “right side of the rivalry” — as well as Gibby and Ozzie will help, but it will be Stan the Man shaking his hand that will be his true Cardinals baptism. All of his past transgressions will be cleansed away and Miranda and I and everyone else can truly embrace and appreciate Ryan Theriot as a Cardinal. Yes, Opening Day really is magic. There’s a beauty and a pageantry to it, but — perhaps more importantly — it’s also the day when a new season becomes part of our daily lives once again. The winter was long, the spring training games disappointing and none of that matters now. A new beginning, a new year starts today. It’s what we’ve been waiting for. It starts in less than six hours, when Chris Carpenter takes the mound at Busch Stadium for his fifth Opening Day start as a Cardinal.